LIC AAO Final Result 2016 / Scorecard / Marks 2016 - LIC Assistant Administrative Officer Scorecard 2016 Cut off Expected Result date – Check LIC AAO Interview Letter 2016 Final Result/ Merit List Appointment & Joining on licindia.in. 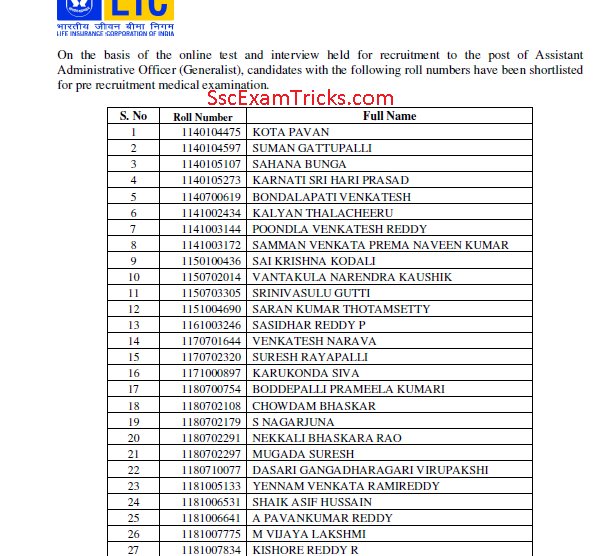 Life Insurance Corporation of India has declared LIC AAO Final Result on 07th September 2016 on official website www.licindia.in with the list of selected candidates who are called for per-recruitment medical examination. The medical exam call letter with date, venue and reporting time has been sent via email address of the candidates. Earlier LIC, India had conducted written test on 05th, 06th, 12th and 13th March 2016 in which 160 questions were given for 300 marks. About 2169 candidates had passed this written exam and shortlisted for interview which was held in April/ May 2016. Now the wait is over as LIC AAO Final result has been published with pre-recruitment medical examination. 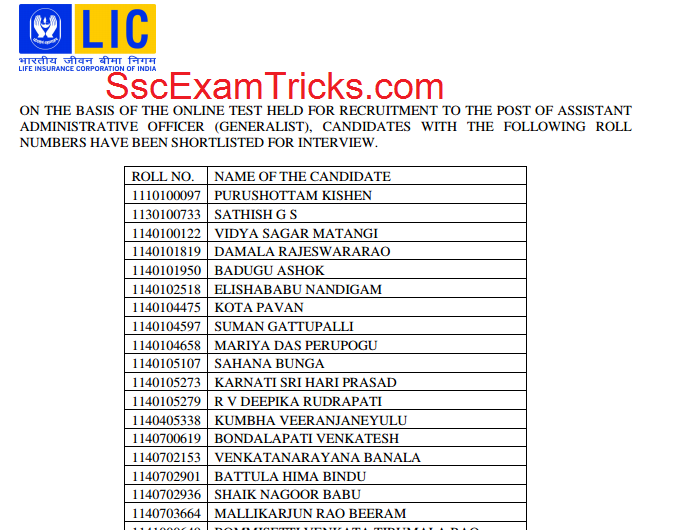 Those candidates who had appeared in interview; they can check LIC AAO Final merit list from direct link given here. LIC AAO Scorecard date: The scorecard is available on 2-3 days after the result date. Now LIC AAO result has been announced now on 01st April 2016. The scorecard /marks list is going to be uploaded on 03rd to 06th April 2016. LIC AAO scorecard / marks can be check here. LIC AAO Result 2016 date: The online test was an objective test of MCQ paper which was given for 150 marks. The time duration for the test was 2 hours. The latest news is that LIC AAO Result 2016 is going to be declared in April 2016. The LIC AAO Scorecard will be available 2 -3 days after the announcement of online test result. 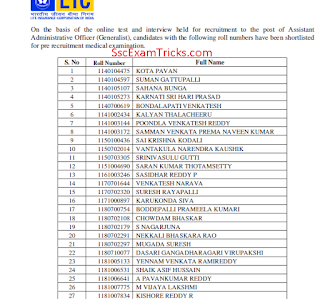 LIC AAO Exam Analysis of 03rd, 05th March 2016: Life Insurance Corporation (LIC) AAO Exam was held on 03rd & 05th March 2016 and all sections were easy to moderate level. The experts have advised that a decision of attempting / solving 80-85 questions would be good enough to score good marks in the online test. LIC AAO Exam Pattern: In reasoning section, row & floor arrangement, syllogism, miscellaneous questions (20 marks) were easy and puzzles based on circular arrangement, person & days were moderate level. In mathematic section, line graph & table based data interpretation, quadratic equations questions (15 marks) were easy level and arithmetic, series based questions (10 marks) were easy to moderate level. In English language, comprehension, Para-jumble questions (20 marks) were moderate level and cloze test, errors, sentence improvement (20 marks) were easy questions that could be solved quickly. 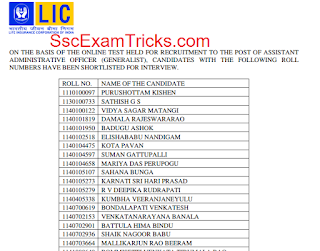 Latest News (01st April 2016): LIC AAO Result has been declared by LIC India on the official website in which shortlisted candidates list has been provided on licindia.in. The qualified candidates are invited to attend interview which is going to be scheduled very shortly by the selection penal. Those candidates who are curiously waiting for their result, they can download LIC AAO Result 2016 PDF from direct link given below. LIC AAO Result 2016 Date: Many rumors have been deployed about ‘LIC AAO Result’, ‘LIC Assistant Administrative Officer merit list’, ‘LIC AAO result date’ that the result and merit list will available in end of March 2016. The concrete information or latest updates / news are that LIC AAO result is going to be declared tentatively in the 2nd week of April 2016 on licindia.in. Latest LIC AAO Result News (25.03.2016): The latest news is that LIC will shortlist about 2100 to 2300 numbers of qualified candidates to be called for LIC AAO interview 2016 which would be schedule after LIC AAO result 2016 declaration on licindia.in. About 15 lakhs candidates had registered and attended in online test organized in March 2016 and now curious to know their LIC result and scorecard which is going to be availabile in 2nd week of April 2016. The online test qualified candidates will be called for personal interview. The successfully qualified candidates will be shortlisted for interview by category wise cut off marks analysis made by the selection board. The interview call letter will be available 7-10 days before interview date. Those candidates who will attain minimum cut off marks; they can download their LIC AAO Interview letter 2016 from direct link given here. LIC AAO Interview Letter 2016 date: LIC Assistant Administrative Officer recruitment 2015-16 had advertised on 15th December 2016 and LIC AAO online application was invited from 15th December to 05th January 2016. Huge numbers of young and dynamic interested applicants (21-30 years) passed graduation / post-graduation had applied for 700 vacant posts of Assistant Administrative Officer (AAO). The application fee was Rs. 600/- for general candidate and Rs. 100/- for SC/ST candidates which had been paid by the candidates. The selection process for suitable candidates will be made by measuring performance in online test and personal interview. The online test was scheduled and successfully held on 05th, 06th and 13th March 2016. LIC AAO Admit Card was uploaded in the last week of February 2016 on official website www.licindia.in. The simplest best process is discussed here which need to be followed by the applicants to download LIC AAO Result 2016 and LIC AAO Scorecard 2016. First, go to the official website www.licindia.in. The direct link will be appeared as ‘Download Assistant Administrative Officer Result Here’. Enter your registration number and date of birth (DD/MM/YYYY). The result and scorecard will be displayed on the screen. Note down your scorecard/ marks obtained in online test and measure / evaluate your performance. Procedure to download LIC AAO Interview Letter 2016: The best process says that you must have to login your account by providing your registration information on the official interview letter page on licindia.in for downloading your LIC AAO Interview letter 2016 by the shortlisted candidates who are interested to attend interview schedule which is to be published by the authority. No one will be allowed without having LIC AAO Interview letter on the scheduled interview session. Please let me know LIC 2016 AAO RESULTS DATE. 2nd week of April 2016. The final date is under discussion by LIC and will be published soon. Mam, when the final result of lic aao will be out? Tell me plz that the final result date of l.I.c. a.a.o interview . WHEN WE CAN EXPECT THE FINAL RESULT OF LIC AAO 2016 TO BE DECLARED ? I expect that the result August last week but not sure. Hoping by 1st week of September 2016.